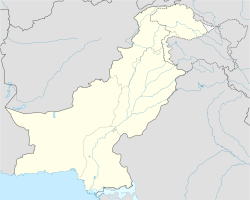 Shahkot (Urdu: شاہ کوٹ‎), is a town and one of three tehsils in the Nankana Sahib District of Punjab, Pakistan. It has a hill park which is being converted to a theme park. ^ "DISTRICT AND TEHSIL LEVEL POPULATION SUMMARY WITH REGION BREAKUP: PUNJAB" (PDF). Pakistan Bureau of Statistics. 2018-01-03. Retrieved 2018-04-30. ^ "Nankana Sahib - Punjab Portal". www.punjab.gov.pk. Retrieved 28 May 2017. ^ "LDA auctions 20 plots for Rs301m". DAWN.COM. 23 January 2015. Retrieved 28 May 2017. This Punjab, Pakistan location article is a stub. You can help Wikipedia by expanding it. This page was last edited on 25 October 2018, at 21:10 (UTC).